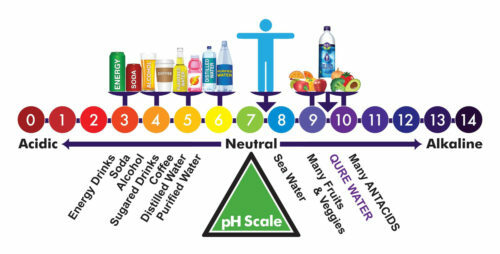 Let’s begin with a basic understanding of pH. “pH” stands for “potential of Hydrogen”. It is the measure of substance’s acidity or alkalinity. The pH scale is logarithmic by multiples of ten, which means that each unit of change equals tenfold. To put it another way, a solution with a pH of 6.0 is 10 times more acidic than neutral pH 7.0 and 5 pH would be 100 times more acidic than pH 7.0 and pH 4.0 is 1000 times more acidic than pH 7.0. In other words, a small change in either direction is a huge difference. The scale ranges from 0 to 14, 0 being the most acidic and 14 being the most alkaline. Neutral is 7, and it’s neither acid nor alkaline. Most artificial and processed foods, purified and distilled water, sodas and flavored sugared beverages are very acidic. On the other hand, many organic fruits and vegetables have an alkalizing effect on our bodies. According to the American Journal of Clinical Nutrition, the majority of our internal fluids should be slightly alkaline with blood being 7.35 to 7.43 pH. Why is body pH Important? The human body is a miraculous wonder. It is designed to manage, maintain and regulate many vital life and health functions simultaneously. One of its vital tasks is to maintain a delicate and narrow range of the pH of our internal fluids. This slightly alkaline range is so critical that if your pH suddenly becomes too acidic or too alkaline you will go into cardiac arrest and die. On a less severe case, if you burden this balance with an over acidic diet lacking essential nutrients and alkaline minerals, your body’s pH balance can be disrupted. This can make it hard for your body to maintain its slightly alkaline pH therefore making it prone to ailments and diseases. Over acidity can be a result of long term consumption of an acidic diet and the accumulation of undisposed internal acidic waste. Just like a fish is as healthy as the water it swims in, our cells are as healthy as our internal fluids. Many of us, like our fish metaphor, have poor health because our cells are swimming in dirty acidic internal fluids. All biological body processes leave behind a byproduct of acidic waste. Our body is constantly at work trying to dispose of acidic waste in order to sustain a clean healthy pH-balanced internal environment. This process is normally accomplished by neutralizing acidic waste with alkaline buffers which are made from alkaline minerals (that we get from food) and getting rid of the waste through urination, defecation, perspiration and exhalation. As we get older, our alkaline buffers diminish and our bodies’ ability to dispose of acidic waste decreases. It is worsen by the Western Diet which consists of artificially processed foods and beverages (such as sodas, energy drinks, coffee, sugared juices, purified and distilled water), poor hydration, a stressful lifestyle and environmental pollution. All these create more unnecessary acids in our bodies. This over-acidic internal environment can promote the gradual inset of many types of ailments and diseases. In order to help our body neutralize acids, rid waste and regain balance, we must properly hydrate and consume a healthy diet of vegetables and fruits which are rich in natural alkaline minerals. Our body uses these minerals to create bicarbonate alkaline buffers to neutralize acidity and uses water to hydrate cells, move and dispose of acidic waste. QURE WATER is a great choice of cellular cleansing hydrating water. Plus, its powerful 10 alkalinity is designed to counteract, reduce or neutralize the low acidic pH of the average artificially flavored, processed, sugared, colored, carbonated beverages most of us consume on a regular basis. EAT HEALTHY & DRINK QURE!